I was invited for a lovely lunch by Karen and Loren to their new abode in White Plains: K&L Cafe by Blushing Cupcakes. Moving their Ortigas location to a homier White Plains paved way for them to recreate their restaurant into a lovely cafe that serves delicious dishes using some of the finest ingredients from Baguio City, where they spent their childhood. We started with Session Salad with Strawberry Wine Vinaigrette (Php 175) and Grilled Ham & Cheese (Php 227). Sumo Sam will be turning 9 this December 23, 2014! 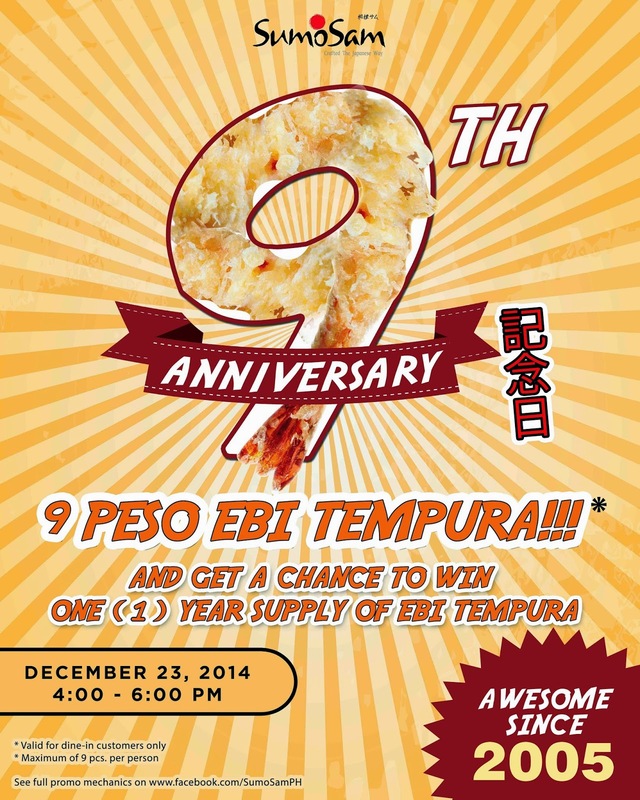 On December 23, 2014, from 4:00pm to 6:00pm, Sumo Sam is offering its popular Ebi Tempura at only Php 9 each. Each person can order up to nine (9) pcs Ebi Tempura! 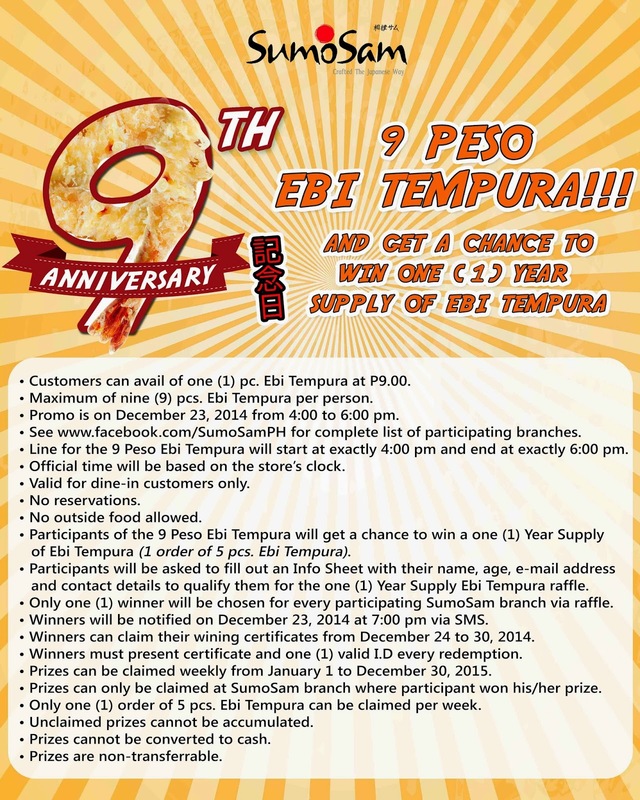 Diner who avail of the P9 Tempura will get a chance to win one (1) year supply of Ebi Tempura. Check out their Facebook page for the participating branches. Note: Crazy Chicken was rebranded to Chicken Studio last March 2018. Our second stop for our Marikina food trip was Crazy Chicken, located along Lilac Street. I eat chicken almost everyday, but we still went on to try this place because of one flavor I haven't tried before: the Black Listed or the chocolate-coated chicken. Crazy Chicken has 6 flavors: Korean Spice, Original Buffalo, Garlic Parmesan, Soy Garlic, Lemon Pepper and Black Listed. We settled with Wings Solo (4pcs, Php 109) and Drumsticks Solo (2 pcs, Php 109). Other serving sizes available are Duo (8 pcs of Wings or 4 pcs of Drumsticks for Php 213) and Family (16 pcs of Wings or 8 pcs of Drumsticks for Php 428).